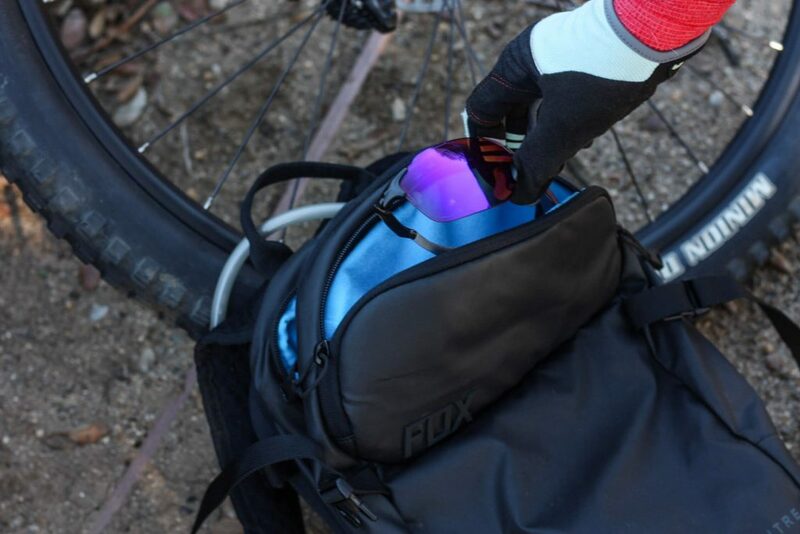 The Fox Racing Convoy Hydration Pack is a performance trail bag designed to keep you hydrated and stocked with the bike supplies for your ride. A hydration pack is designed to make drinking water quick, easy and convenient. There are many different types of hydration packs on the market, each created for their respective activities. They are a really popular choice for mountain biking since they allow for taking more water than the traditional cycling water bottle, which is important because you can be gone for long periods of time away from a water source. 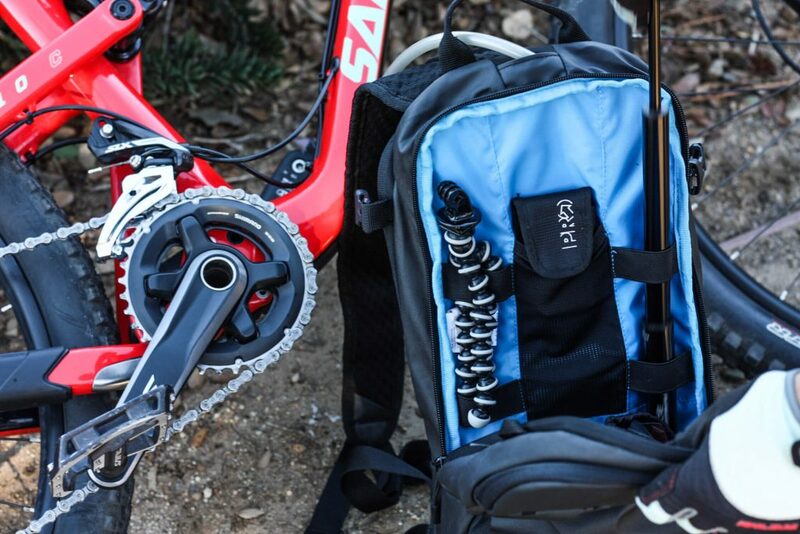 The Fox Racing Convoy Hydration Pack will not only hold your water to keep you hydrated, but will also carry other essentials you may need for your ride. The Fox Racing Convoy Hydration Pack is made of high quality materials while remaining lightweight and comfortable to wear. The shoulder straps are soft and flexible, and they have two adjustable straps-one on the sternum and one on the waist to keep the pack on your back allowing very little movement while riding. The water reservoir can hold 3 liters of water, and has a slide top opening that opens wide for filling and cleaning. You can easily stick your hand in the pack to clean, and hold it vertical while filling with water. Previous experiences filling and cleaning a bladder was with a “twist off” cap and a small opening, very difficult to empty and clean properly. Not a problem with this bladder. The Bite Surge Valve can be twisted on or off to allow the water to flow and water flows from the valve with little effort. The tube clips on to the shoulder straps for easy access when it’s not in use, and easily unclips when it’s time for a drink. Since your pack is bound to get dirty, the water resistant material on the exterior is easy to wipe down and clean up before the next ride. 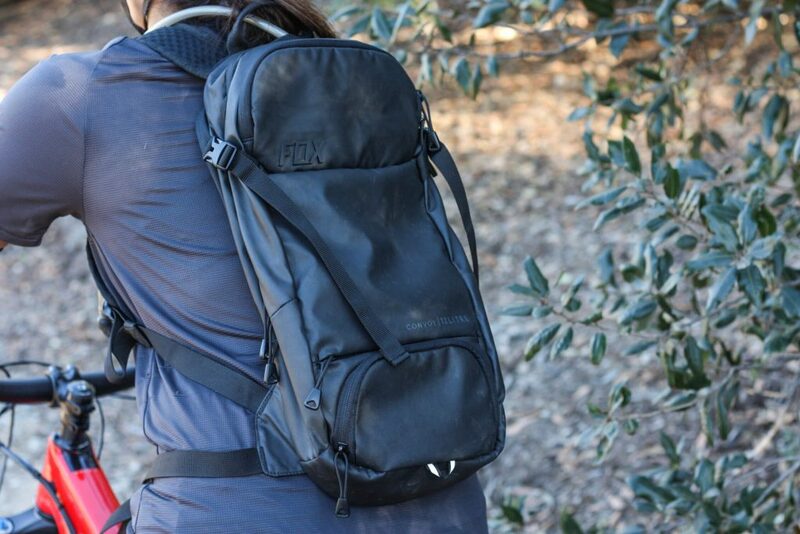 The Fox Convoy has 3 compartments apart from the water reservoir pocket. The large main compartment has more than enough room for all of your pack essentials. 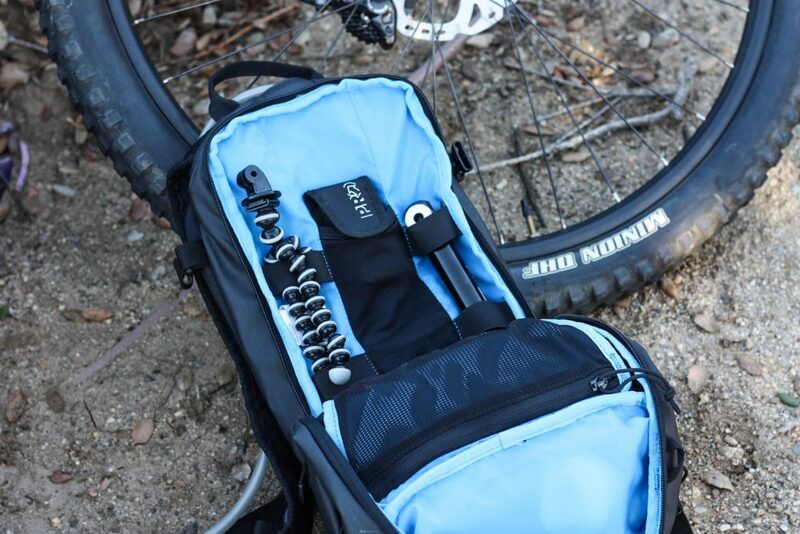 With an array of accessory pockets in this compartment, you can easily organize your mini pump, spare tubes, extra tire, tire levers and first aid kit. The dedicated tool storage pocket on the front of the bag keeps your multi-tool easily accessible for on-the-fly adjustments. The top pocket is fleece lined and reserved for your phone, sunglasses or goggles. Another great feature of this pack is the stowable stretch mesh helmet holder that allows for your trail helmet to be secured and kept out of the way before or after a ride. At just under 16 inches, this isn’t a bag recommended for short rides. It’s a little on the larger side with 12 liters of bag capacity, so you may want to consider a hip pack or a smaller backpack if you’re on a short or quick ride. Overall, the Fox Racing Convoy Hydration Pack is a performance trail bag that offers multiple features that won’t leave you needing more. It has a clean, sleek aesthetic and instinctive design. I typically will only use this particular pack on longer rides where I need to be more prepared and carry more supplies. 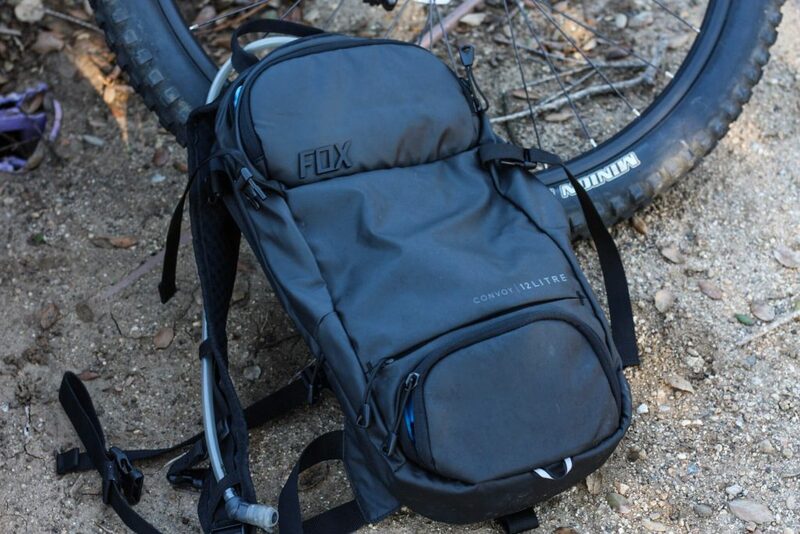 Fox Racing has definitely produced a quality product in the Convoy Hydration Pack and I highly recommend it for the rider who likes to be prepared on the trail.